Finally combining my love of gardening and my need to slaughter the undead, Plants vs. Zombies is a unique tower defense game from PopCap Games. 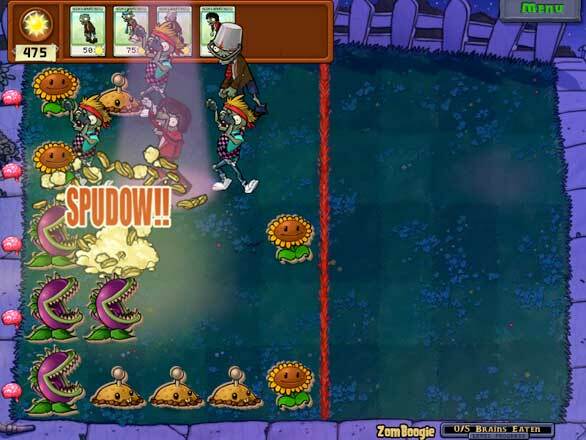 In Plants vs. Zombies, you’re a home owner with a zombie problem. The undead want to invade your yard and get to your delicious brains. Your best defense is to plant peapods, mushrooms, squash, and other deadly legumes (deadly to the undead, that is) to fight back the zombie hordes. The beautiful cartoon artwork is on the right side of zany and sets a light-hearted tone from the get-go. The zombies are silly, distinctive enemies that vary in character, from your standard groaning zombie to zombie football players, zamboni-riding zombies, zombie dolphin teams, and zombie balloon riders. Each has a distinct battle skill that you’ll have to confront. Thankfully, Crazy Dave is on your side. He’s the game’s guide, shopkeeper, and constant comic relief. He’ll introduce you to the different modes of the game, sell you new seeds, and spout gibberish. Crazy Dave is also one of the weirdest characters I’ve seen in a game, at times extremely helpful and other times channeling Hunter S. Thompson a la Fear and Loathing in Las Vegas. The lifeblood of your plant army is smiling sunflowers that produce precious sunshine. You can use sunshine to purchase plants that will defend your five or six lanes of lawn or roof from the invading zombies. Just as each zombie has its own skill, each plant has its own ability. Walnuts serve as walls (that's a pun, get it? ), snow peas shoot icy peas, peppers explode, and cacti fire spikes. 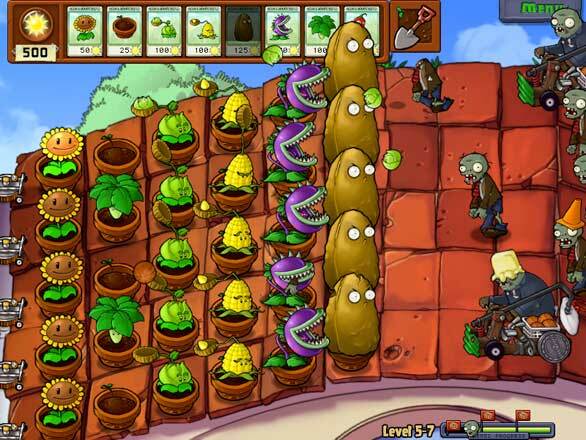 As a tower defense strategy game, Plants vs. Zombies is remarkably deep. There are over 24 types of seeds and zombies, so the game goes far beyond the typical “rock-paper-scissors” formula. Some plants will be nearly universally useful, while others will be very helpful against some very deadly specialty zombies. For example, when playing throughout the backyard missions (where you’ll have to deploy lily pads or other water-based plants to fend off inflatable-duck-wearing zombies) I had to be vigilant against mining zombies that could burrow under my lines and attack me from my flank. I eventually deployed twin direction pea pods and potato mines—the combination helped stave back the horde and I lived for another day. This addictive game has six main levels in adventure mode, split into a number of missions per level. You’ll defend your front yard, backyard and roof in both nighttime and daytime settings, using different plants for each mission. As you progress, you’ll unlock the other modes of the game, a Zen garden, and an almanac explaining the abilities of your plants and your enemy zombies. There are 20 mini-games, 20 puzzle missions, and 11 survival modes that require you to survive with a given lawn for a specific time. Each environment has its own advantages and challenges, but by the end you’ll be wishing they were more varied, exotic, and bigger. On my 2.66GHz Core 2 Duo MacBook Pro, the distinctive art came through in bright colors and vivid detail. As a cartoon-based strategy game, I imagine that a lesser processor could handle the workload, even with a large army of zombies on the screen at any one time. Not since Zombies Ate My Neighbors have I seen a deeper, longer, more challenging and memorable zombie game. It’s truly fun for all ages, and one of the most bizarrely comical games I’ve played in the last few years. Don’t let the cartoonish art or light-hearted atmosphere throw you off; this is one of the most clever and original strategy games out there. 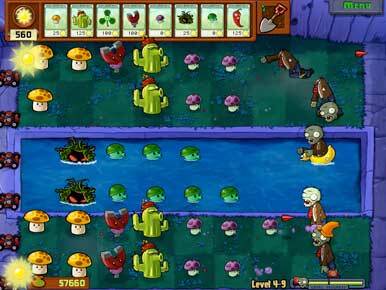 Plants vs. Zombies leaves you hungry-not for brains, but for more games like it. Let’s hope there’s a sequel taking root.